While I’ve recently been slacking in the gym I’m trying to incorporate a lot more running into my fitness regime. I know a lot of people find it difficult to find an exercise they enjoy or something they can stick too – don’t get me wrong I’m the same but I have a strange love/hate relationship with running. I used to run all the time, almost every day to be exact. Unfortunately due to circumstances I had to stop, which for me was extremely difficult. I won’t go into the deetsss and go off track (I’ll save that for another post) but yeh it meant that I lost my love for running. Although I love going to the gym, I also love love loveee getting outdoors and training. There’s something about fresh air and natural sounds that I can’t get enough of. I simply love throwing on my sportswear and trainers and getting outside, really to me there’s nothing better. I recently went to Cornwall for the weekend. I decided to take my running shoes with me just in case I decided to run – I didn’t want to put any pressure on myself to exercise as the weekend was purely meant for relaxation. I have a bad habit of beating myself up for not exercising so I didn’t want this to be the case. I thought at least if I bring them, the option is there. I also find running the best way to explore places as you get to see so much more just by getting out and going for a run. On the Saturday morning I woke up aand felt like getting outside. Although the weather wasnt the greatest, I was so eager to get down to the beach and be near the sea. So I decided to get up and go for a run down by the beach and along the sand dunes and of course I had to drag Jamal with me! I don’t think he minded as he’s trying to build up his fitness atm too so he keeps me going. We didn’t time the run or track how far we’d gone as it was simply for fun! It was definitely my favourite part of the trip. Waking up early and making the most of your day is the best! We got to explore the beaches and find some cool routes for runners along the sand dunes. However, let me tell you, running on the beach, in the wind and up the hills through the sand dunes is NOT easy!! Wow, my legs were on fiyaaa and it really helped me to realise I need to work on my fitness, ha! And of course we made time to stop and take a few picsss – big up my photographer in training lols! It was a great way to get out and about and see more of where we were staying – which btw was a place called Perranporth. It’s absolutely beautiful here and on the plus side they have the most amazing beaches. I just wanted to write this post as a kind of update on where I’m at with my fitness atm. Although I’m not training in the gym 24/7 I’m currently doing what I enjoy, which at the end of the day is all that counts and guess what? I feel soooo good for it. 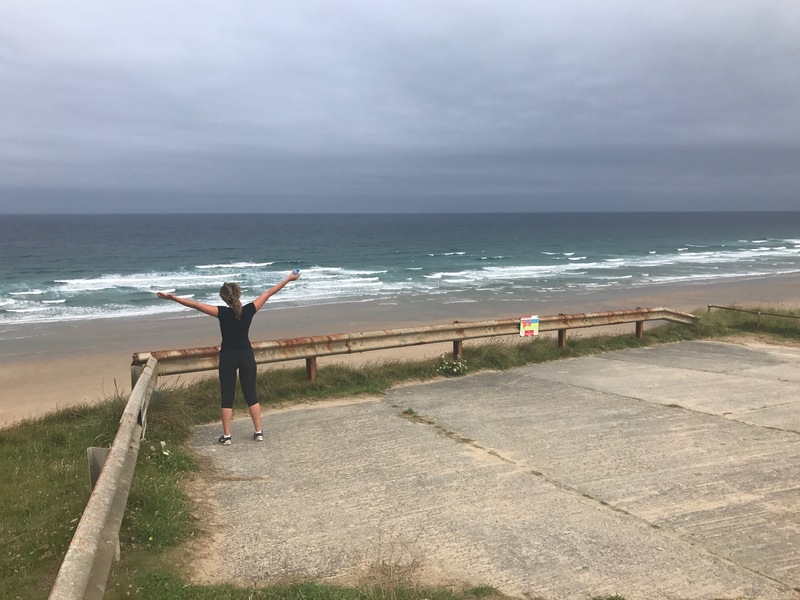 There are so many benefits to running and training outdoors – plus for me it’s my favourite way to escape and destress from daily life. As always, thank you for reading guys.